It’s basically a party that members of the Connecticut beer industry have decided to throw in honor of… itself. The statewide event non-coincidentally coincides with the American Craft Beer Week. That’s the one that invented by the Brewers Association to promote the craft beer industry. By craft beer, we’re talking smaller than Budweiser, which basically has its week every week, with a special holiday on Super Bowl Sunday. 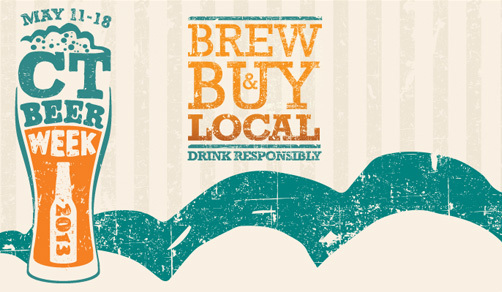 The focus of the campaign this year, as it’s been promoted by brewers, wholesalers, retailers and restaurants is “Brew & Buy Local.” There are a bunch of events around the week, and it’s your duty as a capitalist craft beer lover to consume for the cause. Kicking off the week is the Rising Pint Brewfest on Saturday at Rentschler Field in East Hartford. From 1 to 5 p.m. you can sample from 250 craft beer varieties from about 60 breweries, listen to live music stuff yourself with food from Greater Hartford restaurants. You can call (800) 745-3000 for $40 tickets. There will be several “tap takeovers” this coming week, which means that breweries give a number of taps over to a specific brewery. In this case, they’ll be ceding their space to Connecticut breweries. Among other locations, you can try some Nutmeg State beers at any of five Plan B Burger Bars, Max Burger at 124 LaSalle Rd. in West Hartford, Westbrook Lobster at 300 Church St. in Wallingford and Pies & Pints at 1 Store Rd. in Middlebury. If you’re looking to see our state’s breweries and don’t want to drive, you can sign up for a Brewery Bus Tour from 10:30 a.m. to 6:15 p.m. on Saturday. It’s run by CT Beer Trail and begins and ends at SBC Southport Brewing Co. at 2600 Post Road in Southport. Besides SBC, the trip includes stops at Shebeen Brewing in Wolcott, 1249 Wine Bar in Waterbury, Cavalry Brewing in Oxford and Two Roads Brewing in Stratford. For information, call (800) 292-0279. On May 16, at J. Timothy’s Tavern, at 143 New Britain Ave. in Plainville, you can meet local brewers, starting at 7 p.m. Closing out the festivities, on May 18, Jesse Camille’s Restaurant (615 N. Church St., Naugatuck) is hosting its CT Craft Brewers Festival. For $30 in advance, you can celebrate Connecticut beers as well as beers from all over. Check out this flyer for more information. For a full slate of listings, go to www.ctbeerweek.com. This entry was posted in Beer Snob and tagged brew fest, Connecticut. Bookmark the permalink.